Following our review of Nanotec's Golden Strada #79 nano3, we received a request from Mr. Hayashi Takeshi to take a critical look at their new interconnect named Golden Strada #201 nano3. We liked the performance of the loudspeaker cables. They delivered excellent sound at a very decent price. Seeing how Nanotec now applied the same technology to an interconnect, we thought this an interesting proposition. The cable was delivered promptly. It is amazing to witness a parcel being sent from Japan arriving in Holland this fast. An ordinary letter from Rotterdam to Amsterdam -- a journey of 60 km north -- takes longer. The interconnect was 1.8 meters long with a nice feel. The white-sleeved link felt heavy and supple at once. This cable would be easy to deploy. Termination is by locking RCA whose generous casing and ribbed finish made things easy to connect. Inside the cable things are a little more complex. Nanotec runs the same wires as in the #79 nano3 loudspeaker cables, now in a 20-per conductor config. Each wire is 0.18mm in diameter and painted with a colloidal liquid suspended in which are gold and silver particles in a fixed 9:1 ration favoring gold. The suspending liquid is squalene harvested from deep-sea sharks and as such, an oil with a strong oxygen-binding potential to prevent the OFC copper wires from oxidizing and thus deteriorating the sound over time. By using a colloidal liquid with nano-sized gold and silver particles, the use of high-quality OFC copper for the conductor cores suffices. There is no need for costly metallurgical copper, silver and gold alloys. Nanotec's MO makes sense. We learned that copper conductor has a very basic frequency capacity which slightly favors the bass. Silver has better treble response but can get somewhat out of control to cause harshness. Even more than copper, gold leans towards the lower frequencies but its innate resistance can be sluggish in response to a music signal. As many audio cable manufacturers who either produce or source their own metallurgical recipes have experienced, it's not easy to create a copper/silver/gold alloy. Various techniques have been successful, others failed but all came at a price. R&D is not cheap and when a satisfying compound has been created, the minimum length commitments for production are substantial and initial funding accordingly severe. Real metallurgy in cables where molecules of dissimilar metals are intermingled is expensive by design. Less so is plating where an extremely thin layer of silver and/or gold is deposited on a high-quality copper carrier. But by far the simplest way of adding the benefits of silver and gold to copper is how Nanotec goes about it: by doping the wire in an oil that contains minute gold and silver particles. The two bundles of doped wire strands are then sleeved in high-grade PVC sheet, with cotton-string dampers to prevent friction and resonance between the strands. A Japanese rice paper then bundles this geometry before a 129 x 0.012 wire mesh shield without squalene treatment is applied. This semi-floating shield only attaches to the RCA whose directional arrow points away from it. A leaflet accompanied the cables to explain that although the cable bears directivity markers, this would not always be the correct setup. The best sound might require reverse hook-up. Between a pre and power amp, the indicated direction is in most cases correct. While connecting a DAC or CDP to a power amp, the results may vary and some experimentation is advised. For the listening sessions, we hooked up the cable between the DAC and power amp following the indicated direction. Then the cable was fed with a musical signal for casual listening. From the first second of playing, there was no harshness or muffling but nevertheless, the burn-in went on for the better part of the day. After a period of several hours of playing music, it was time for some serious listening. From the pile of CDs at hand we chose certain female vocals to start with. If the cable presented any real faults, these would be clear very soon: Dulce Pontes with her at times glassy voice, Anna Maria Jopek with a much more rounded and lower pitch and Spaniard Silvia Perez Cruz (on Llama with Ravid Goldschmid on MA M070A) whose timbre and reach fall somewhere in-between. During the review period, we also received a set of three live recordings on CDR made in three different Dutch venues of the same concert. We went to one of these performances and could at least compare mental notes with the recording of that particular venue. Part of the concert was Elgar's Cello Concerto in E, opus 85 featuring one of Holland's most prominent cellists. On all the music we played, the GS #201 nano3 was a pleasing part of the musical experience. The cable did not add much by way of signature but was not completely transparent either. No cable is completely transparent but the main point is, how much does a cable alter the signal in perceived timbre, coloration, transparency and timing? Probably the most important part is the last, timing. If a cable is sluggish (too much gold? ), the resultant timing is off, something human perception is very sensitive to. Second is timbre where timing, by way of transients and decay, also plays a role. Silver cables have a tendency to influence sustain and decay. Overall this cable had a tendency for slight warmth and solidity, making the music gentle and liquid. Transients were handled effortlessly such that dynamics were neither damped nor boosted. How would Nanotec's interconnect compare to other cables at hand? Besides those mentioned in the intro, we had an amorphous metal link from a proof of concept experiment. 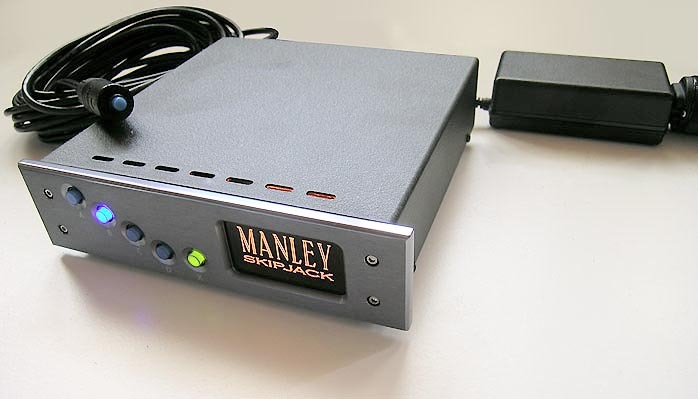 We used the Y-cables Crystal Cable had made for us to split the signal from the DAC to the Manley Skipjack. This unit makes it possible to perform A/B/X comparisons of cables. To be fair, competing against two forms of amorphous cables is not easy, not only sonically where these cables display an unsurpassed finesse but also financially. Producing cable with conductors which are thinner than blond human hair, can't be soldered but still must be safely attached to a connector such that endless connects and disconnects won't break anything is a highly challenging proposition, hence expensive. In comparison to the other cables, the Nanotec stood out in how it handled timbres. It was easy to pick this out in the A/B/X comparison as it appealed the most to our notion of how things should sound. On the live Edgar recordings, the differences in floor resonance were good checkpoints. Celli and basses connect their bodies to the podium through the end pin and hence couple to the floor. The solo cellist, by the way, brought his own resonant podium to control his timbre. In conclusion, the Nanotec Golden Strada #201 nano3 uses an innovative method of dispersed nano silver and gold particles in an oily mixture to successfully dope a copper audio interconnect without requiring costly alloy formulations. In the audio chain, the interconnect is probably the most influential and thus most influenceable cable. We liked the #201 nano3 very much, not only for its ability to conduct music without interference but for not breaking the bank. Quality of packing: The cable came in a good quality double box. Reusability of packing: Many times. Quality of owner's manual: Simple leaflet but clear enough. Website comments: Unfortunately only in Japanese. Human interactions: Very prompt and courteous. Suggestions: None at the moment.